First printed in Aeronotes (Official Journal of the Australian Ballooning Federation) Volume 36 No 2 (June, 2014). Links to sites added for this online version. If you’ve never flown at the Sunrice Festival in Leeton over Easter, you owe it to yourself to give it a whirl. Held every second year, there are a number of activities that make up the event but the balloons are a welcome & important part of it. With plenty of wide open spaces to fly over, only a handful of areas to avoid, a big oval for the night-glow and plenty of social activities, the Leeton event is relaxed, fun and highly recommended. The flying at Leeton was great fun and we were able to recruit some locals to help us with crewing as we hadn’t brought our own with us. In addition to the social flyers, Paul & Maaike were there once again with a 240 taking paying passengers for flights. Flights were conducted each morning & afternoon although we skipped the afternoon flights as I’m not a huge fan of windy inflations and with Kitt there we wanted to be sure we could make it to the social events. Given I hadn’t flown since mid-December, my first flight on the Friday morning was just for Kitt & I as I got back into the groove. 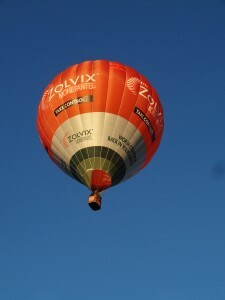 I was flying the Zolvix balloon and it was during this flight that the call sign “Sheep Dip” was assigned to us. This flight took a few balloons near the abattoir and some had tricky retrieves but we managed to land in an open field that, aside from being rather lumpy, provided an easy retrieve. Being Good Friday most places in Leeton were closed except for the “Tourist Supermarket” which does a damned good hamburger so we weren’t left in the lurch at all. 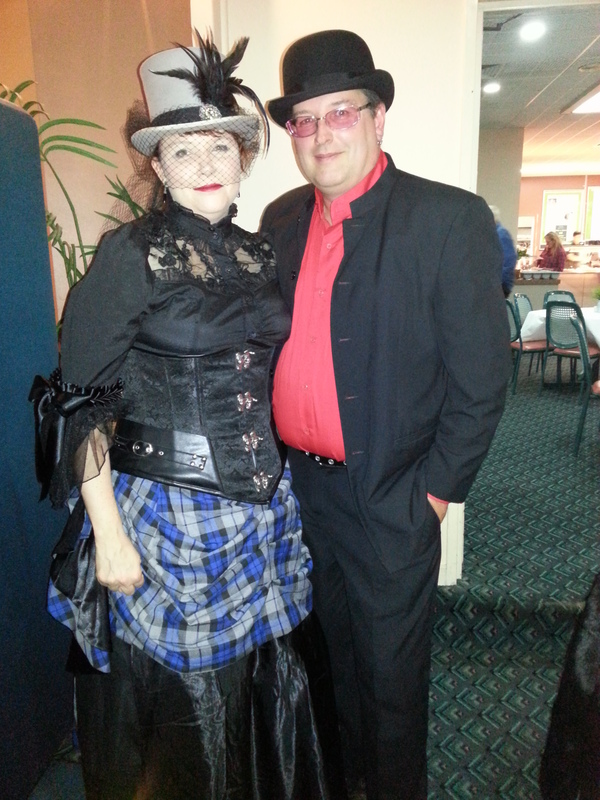 The “Cowboys and Indians” themed dinner at the Soldiers Club gave Kitt an excuse to have fun putting together a rather elaborate Wild West themed outfit. Suffice to say, her efforts paid off as we wound up winning the costume competition. Saturday morning’s flight took us over town to the north for a somewhat short (3/4 hour) but fun flight as, like most of the pack, I elected to land at the airstrip rather than continue on over the hills. For this flight we had Emma (Barb’s daughter ) and her friends Kat & Sean crewing. As Kat had never flown before, we took her up for her first go (a Kitt Kat flight? How could I resist?). Having Kat on board gave me a good excuse to take the easy option as I just didn’t feel like a drag landing & the winds were forecast to pick up as the morning progressed. Later that day, many of the balloon pilots & crew went in the street parade but thanks to our costume win the night before, Kitt & I had won tickets to the “Longest Lunch” being held in the park. We’d heard good things about past events and this year’s wasn’t too bad either. There were some hassles with food deliveries that delayed arrival of some courses but when they’re cooking for almost 200 people and using a different kitchen to previous events, issues are bound to crop up. Over all the food was good and the company was fun as we wound up seated with some fixed-wing pilots: go figure. Hopefully they’ll have ironed out the bugs for the next time. Saturday night was a “BYO everything” BBQ at the camp grounds as many of the other pilots & their families were staying there. We coordinated with Jodi & Martin to share our purchases of various foods and it was fun to hang out & relax for a while. I’m not sure if many stayed on long but we had to leave rather early to get some much needed sleep before the next morning’s flight. Sunday morning’s flight was a “Hare & Hounds” with Paul volunteering to be the hare. 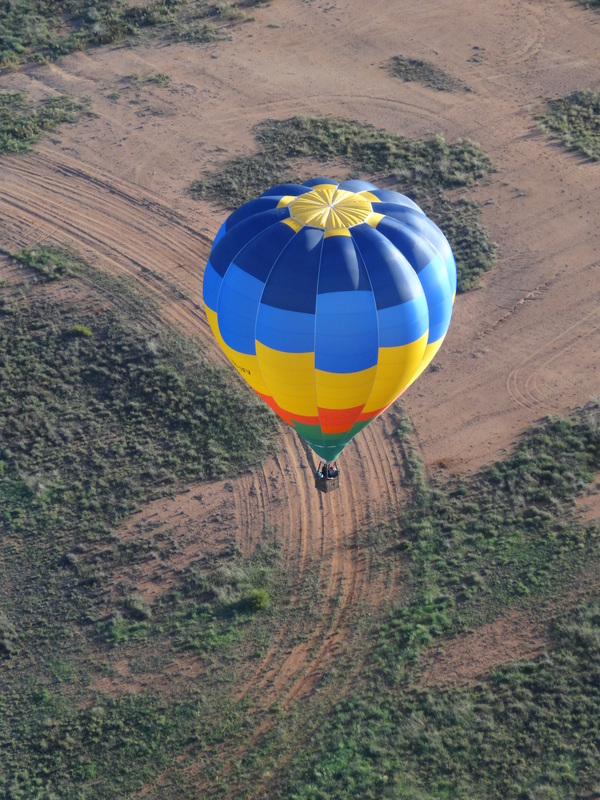 Kitt stayed on the ground to crew with Emma & Kat and I took Sean and Jason up for their first balloon flight. 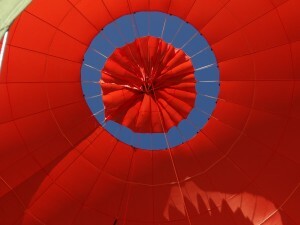 As we drew closer to the target point, keeping an eye on the other balloons around us became very important. I dropped in behind Scobie & Angus expecting to get the same direction they had but found instead that I started to drift off to the left. Rather frustrating as I was at the about same level and only a short distance behind them. To quote the Princess Bride movie: I wonder if he is using the same wind we are using. After yet another siesta, we headed to the Number 1 Oval for the night glow. I’d brought the Sherrin Flying Football special shape with me and was a little nervous as it was my first glow event. All went well and the crowd enjoyed the spectacle with Danny Galbraith providing commentary & getting the kids to count down for us to start burning. You’d think that after all these activities, those of us who hadn’t already left for Canowindra would be too tired but no, a number of us turned up once again on Monday morning for the last flight of the event. With the wind models showing surface northerlies with south-easterlies at around 2,000′, I elected to do a double hop & give some more “first flights.” Kat’s partner Max had arrived the evening before so I took them up for a flight together. After about 1/2 an hour we landed about 2km from our start point and swapped in Louise (Craig’s friend who’d designed the Leeton shirts) and the daughter of Jo & Luke (my crew from Friday). At this point we reached the worst part of the Leeton event: saying goodbye to everyone and starting the long drive home. All good things must come to an end and so too our time at Leeton. I’d like to pass on our thanks to everyone who helped make this event so much fun. Barb Smith made sure we all supplied the correct paperwork for flying & the various social events while Justin & Danny Galbraith ran the pre-flight briefings & kept an eye on our flights. Craig Berry ran around keeping everything going smoothly and also managed to secure fuel sponsorship for the event. Fortunately it managed to last until Sunday morning which helped a lot.